Join us as we celebrate the community of makers known as the Cleveland School, whose artistic contributions made an important impact on the American cultural landscape throughout much of the 20th century. This stunning display of over 150 works of art and design was conceived as a celebration of the Cleveland School and their important role within our city’s longstanding tradition of artistic excellence. As a not-for-profit exhibition, Cleveland: A Cultural Center is the first of its kind for WOLFS. The vast majority of exhibited works have been loaned from private collections. Curated by Henry Adams, Ph.D.
WOLFS is pleased to present Cleveland: A Cultural Center, an exhibition of over 150 works originating from the Cleveland School, a community of exceptionally talented artists which began to take shape in Northeast Ohio during the early 1900s. 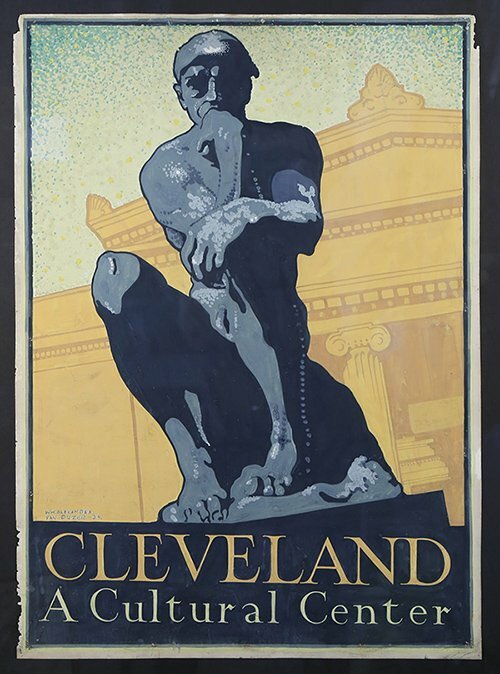 The men and women of the Cleveland School would go on to contribute a staggering number of beautiful and important works of art and design throughout much of the 20th century. rarely having been exhibited publicly. Not since The Cleveland Museum of Art’s 1996 exhibition, Transformations in Cleveland Art, has such a comprehensive survey of the Cleveland School’s remarkable legacy been available for public viewing. Curated by Henry Adams, Professor of Art History at Case Western Reserve University and noted authority on the Cleveland School, Cleveland: A Cultural Center is a celebration of both the Cleveland School’s enormous impact on the region’s cultural landscape, and its importance within the larger narrative of American art history. This loan exhibition is drawn almost entirely from private Cleveland School collections throughout the country. In fact, a great many of the works included in the exhibition were acquired from WOLFS over the course of the last four decades. By assembling the finest examples of work by the Cleveland School’s most talented artists, a vibrant visual chemistry results in a compelling chronicle of 20th century American Art. Cleveland: A Cultural Center will be on view at WOLFS through August 31st, 2018.